If you are a sock knitter and you don’t like knitting the same patterns over and over again you will sooner or later come to a point where you need inspiration and instructions to create your own. But how do you do that? Where do you start? What would even be a good stitch pattern to use on a sock? Aren’t there any books for that? 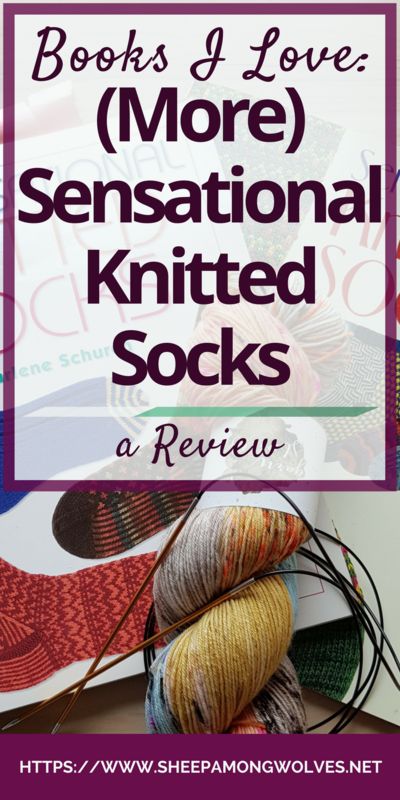 Yes, there are indeed and today I want to introduce you to two of them and review Sensational Knitted Socks (*) and More Sensational Knitted Socks (*) for you. They have been out for well over a decade, so they are anything but new. But they are still great reference books for sock knitters today. Over the years I’ve knit countless of socks for Papa Wolf and as I’ve mentioned before I rarely knit a pattern more than once. There are however simply not that many Papa Wolf compatible sock patterns out there that I would find interesting enough to knit to get a whole pair done for his big feet. I ultimately cracked down and designed a pair from scratch last year. But seven years ago I didn’t feel quite up to that task yet. That’s when I stumbled over the books Sensational Knitted Socks (*) and More Sensational Knitted Socks (*) by Charlene Schurch. What is (More) Sensational Knitted Socks? These books give you basic information on how to knit a sock in almost any yarn. It tells you how to work socks on 4 or 5 double pointed needles or two circulars. Following the instructions for two circulars, you can easily work with the magic loop technique as well. 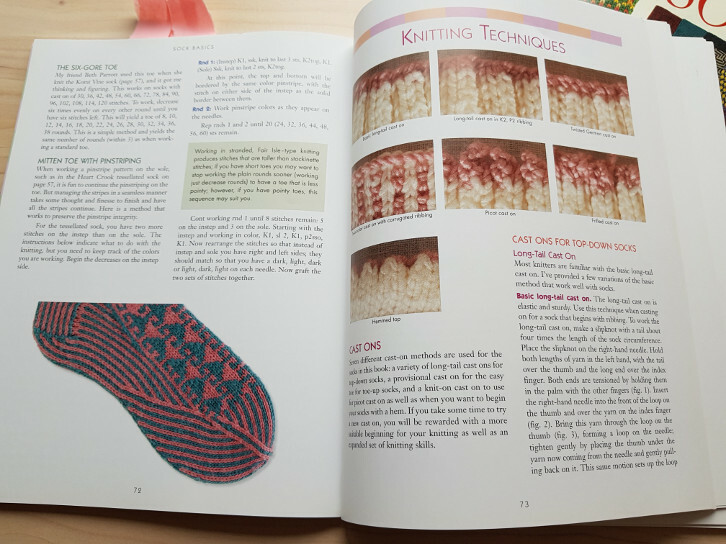 Basic information on sock anatomy and toe-up or cuff-down are given (in the first book). But the instructions only focus on top-down construction. There is also some advice on what to do for wide or narrow heels or reinforcing heels and toes but don’t expect to get any detailed information on how to do this. 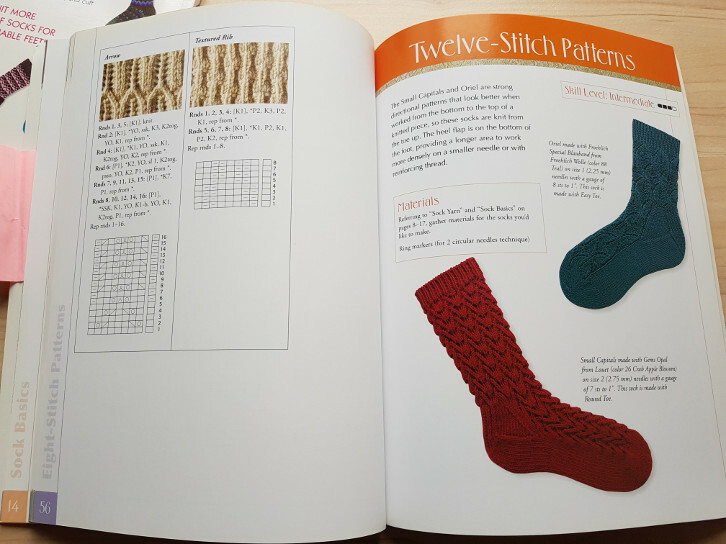 The first book mainly focuses on socks with a heel flap and standard toe but some instructions give you the choice to knit a short row heel or round toe instead. You just have to find the right pattern as there is, unfortunately, no index and no section for techniques. 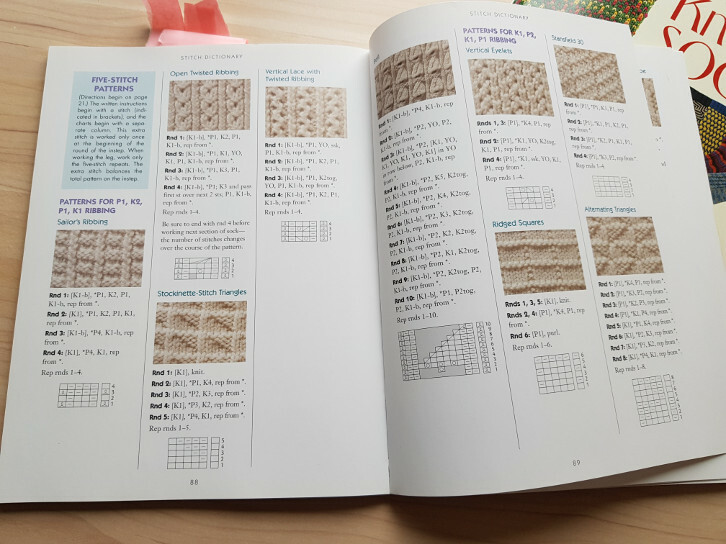 The second book has both a technique section with a few toes and heels to choose from as well as an index. 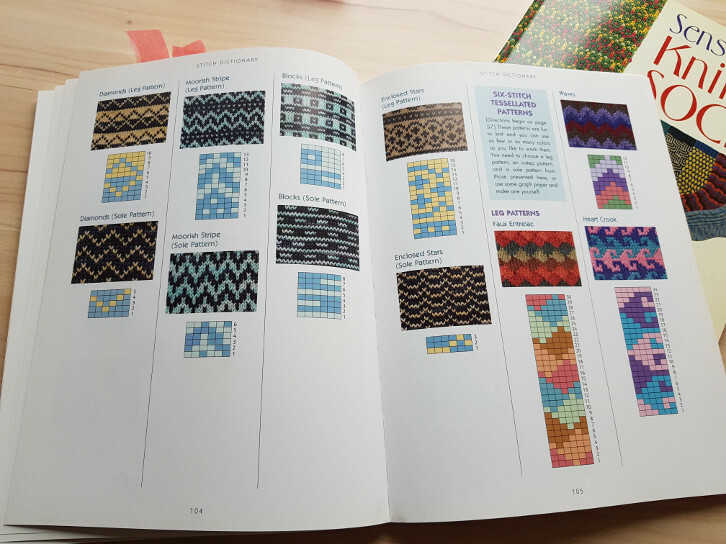 The first book has a couple of different stitch patterns to choose from in each section whereas the second book has a large variety of stitches to choose from in a separate stitch dictionary at the end. 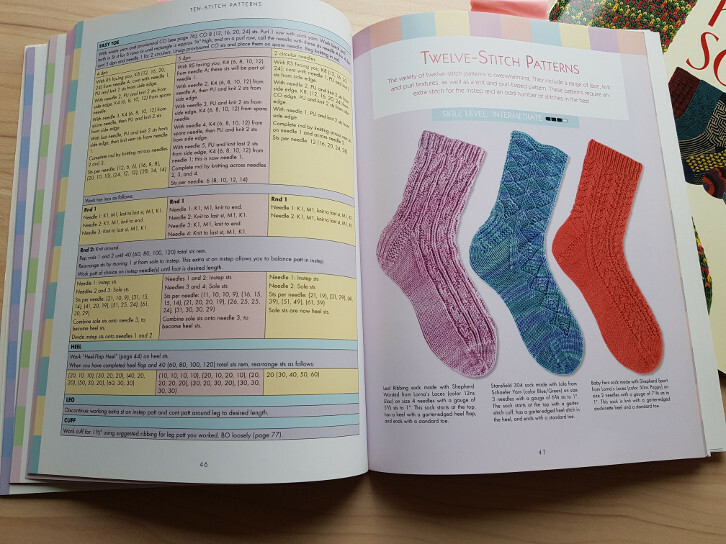 Both books have written instructions and charts for the stitch patterns – except for the stranded colorwork stitches. Those only come with a chart. These books are mainly meant to be a built-your-own-sock toolbox for the experienced sock knitter. 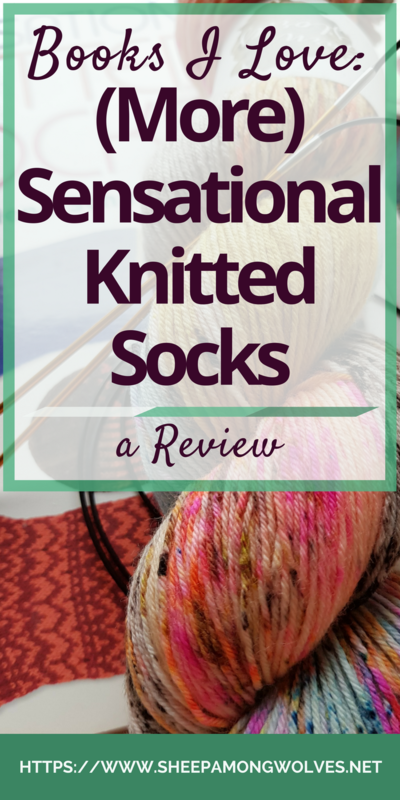 They don’t really teach you how to design a sock pattern but they do teach you how to knit socks with pretty much any stitch pattern you can think of – which was a stepping stone toward designing my own sock patterns for me. First, you pick a stitch pattern. There are different sections based on the number of stitches in a repeat and on stitch type (stranded colorwork and mosaic stitches are in separate sections). Within these sections, you find sample instructions for knitting a sock with this stitch. Each section also includes a couple of example socks and a table where you can look up how many stitches you need to cast on for your gauge and the circumference of the foot the sock is intended for. You then choose the needles you are knitting with (4 or 5 double pointed needles or two circulars) and then simply follow the instructions as you would with any other pattern. I would have liked to see more options for toes and heels. As well as actual detailed instructions on how to work a sock toe-up instead of broad information. The advice section on how to deal with narrow or wide heels or a high instep and general fitting could have been more fleshed out. It was a bit too short and the instructions quite vague. Especially getting colorwork socks to fit when you have thicker than average legs and ankles can be quite tricky. If you are working a stitch pattern you will then have to increase (for toe-up socks which would be my recommendation when you are worried about fit) or decrease (cuff down socks) in pattern. Working out how to do that can be hard even if you have done it before. Sensational Knitted Socks and More Sensational Knitted Socks are right for you if you’ve knit socks before and want some more variety. If you want to make socks with a stitch pattern you like instead of using a finished pattern. You don’t have to limit yourself to the stitch patterns in the books. Just find one that matches one of the sections in the book and follow those instructions. These books are for you if you have to knit a lot of men’s socks and are tired of always knitting the same patterns. They are not a good fit if you have little to no experience with sock knitting. Or if aren’t interested in learning the very basics of putting together a sock of your own design. They aren’t right for you if you are still struggling with working a bit more complex patterns. These stitch patterns are on different pages than the instructions for a sock in the matching section. 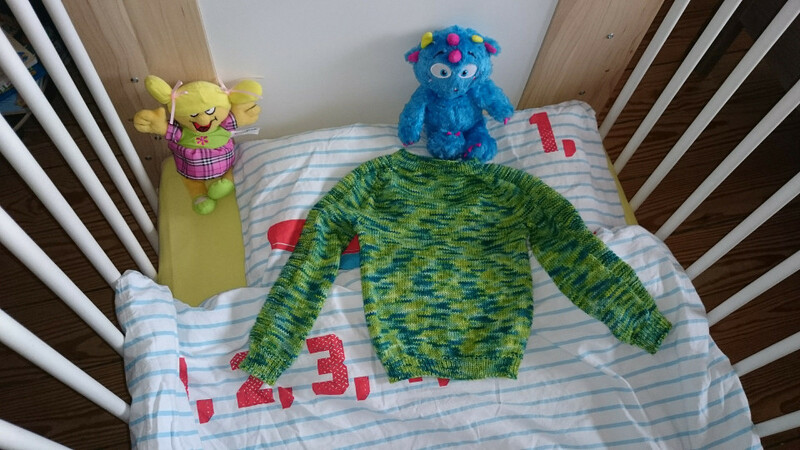 You will need to switch back and forth between the instructions and the stitch pattern. The only way around that is to copy the stitch pattern onto a separate piece of paper. Do you already own these books? What do you think of them? 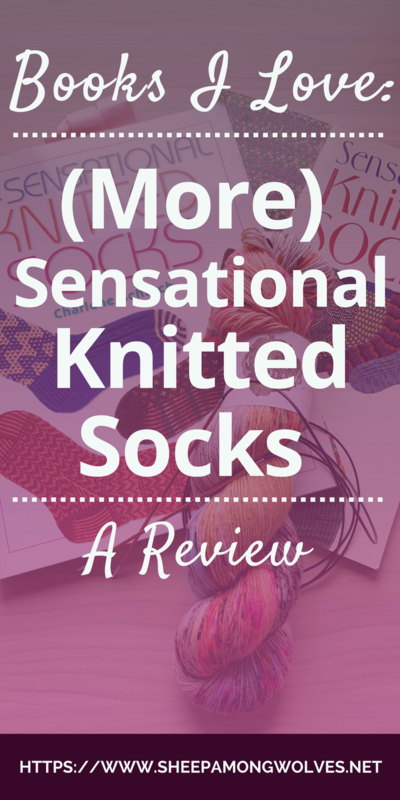 Which other (sock) knitting books would you like me to review? Please let me know in the comments below. If there are any knitting books you would like me to review just drop me a line! I’ll look into it. My forté may be sock knitting but I’m not limited to that subject alone.